Australian History Series Book 4: First Contacts has been written specifically for students living in Australia studying History in Year 4. It explores the movement of, and interaction between, people before the early 1800s. Every activity sheet has a corresponding strudent information page. Both have been created to give students the opportunity to meet the requirements of the Australian National Curriculum. Students will find the tasks in Book 4: First Contacts accessible and engaging, and this will maximise class participation and enjoyment of History. 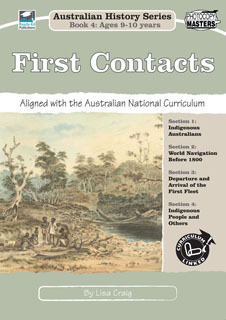 TAustralian History Series Book 4: First Contacts accompanies this workbook. The Australian History Series Workbook Teachers’ Manual for the full series also available.